You are tired, sore, don’t feel well, or don’t feel like working out? All of these are examples of “excuses”, which is a word that Team Body Spartan has removed from their vocabulary. We are all given the same 24 hours in a day and we all want to be successful in some way or form. Yet very few of us will make the sacrifices and pushes it takes to be successful. The Body Spartan team refuses to let anything stop them from crushing a great leg workout – no excuses in this intense, super set leg workout! FULL WORKOUT BELOW THE VIDEO. For this leg workout or ANY workout, we recommend always coming prepared to feed your muscles. Pre-mix and bring your BCAA’s to the gym with you. Have about 10g of BCAA’s in 20 oz of water from your favorite brand. We also recommend adding some creatine so your BCAA’s. That way you are consistently delivering all of the nutrients necessary to not only sustain your energy, but keep you in an anabolic state. Finally, have your post-workout shake in your bag, pre-mixed, ready to go. Full leg workout below but first have a look at our shredding programs that are changing lives! This is the ultimate super set to wake your body up! We take two large compound movements and throw them together for some leg annihilation. First we started with with the front squat, which is a variation of your standard squat that focuses more on the quadriceps. Start by placing the barbell at a height just below your clavicle. Traditional hand placement would be similar to the grip used in cleans. Some people do not have the flexibility in the wrist to do this, so we demonstrate the cross-arm version in the video above. The key to the lift is to have the bar rest on your anterior delts/upper chest (the shelf). Keeping your back strait and chest up, proceed into a squat. Keep in mind, the weight will be less than your back squat weight. For the second part of this set, you’ll set up a barbell for some RDL’s (Romanian dead lifts). Think of a this as a dead lift minus the bottom movement other than the initial lift off. Using dead lift form, you will pick up the weight. Keeping it close to your body, lower the weight while keeping your legs strait. Most of the mechanics of the movement come from your hips. As you lower the weight, kick your hips back and as you come back up, you will be driving your hips forward. This movement can be performed with a wide and close stance. The pump should be ridiculous after that compound super set, but its time to turn up the heat. We jump into Body Spartan’s favorite leg super set because we love chasing the pump. If you have followed our workouts before, then you should know what this is about. We start with hamstring curls, but we change it up a little. Instead of full range of motion, stop the movement half way down. This will keep constant tension in the upper hamstring/lower glutes. The booty pump will be like no other! Once you knock out you curls, immediately jump on the extensions and begin attaining the almost unbearable quad pump. Make sure to curl your toes toward your body to focus on the lower part of your quad (tear drop). If your legs are on fire by the end of the first set, you are doing it right!. By this point it should be hard to walk due to the lactic acid build up in your legs. this next super set should help but disperse the blood but will require you to dig for some explosive strength. Start with hack squats, which is a squat variation that takes the stress off the back and core. You rest your back on a pad and sit down into a squat, making sure that your feet are shoulder width apart. Similar to the front squat, you will realize it focuses on the quadriceps. Slowly lower into the movement and explode from the bottom of the movement to the top. From there you will “limp” to the power squat machine. If you don’t have one, simply turn around on the hack squat machine so that your chest in on the pad. From here you will hinge your hips and kick your but out, keeping a slight bend in your knees. Try to minimize this bend in your knees so that you keep the tension in the hamstrings and glutes. From the bottom of the movement, explode up and drive your hips forward. You are a champion if you made it this far, but if you want to be a spartan you need to squeeze out another 10%, give us 110% – and leave the tank on E. Jeffersons are the best way to end a leg workout, especially if you are struggling to walk. Place the barbell on the ground and stand in the middle of the bar (length wise). Foot placement is important. The goal is not to stand extremely wide perpendicular to the bar. Rather, make sure the imaginary line from your heels connects at a 90 degree angle to each other and separate your feet along the bar, instead of away from the bar. Squat down and grab the front of the bar with your right hand in a neutral grip. Grab the other end of the bar with your left hand with a regular grip. with your back strait and your torso facing the same way as your right hand, begin to lift. The bar should come up between your legs and stop just before your groin. Lower the weight and finish your reps, then switch stance/grip and finish the set with the other side. For an example weight, the guys used just 25-lb plates on each side of the bar. If you do this exercise correctly, you won’t need a whole lot of weight. You want more leg workouts that will ensure you crawl out of the gym? 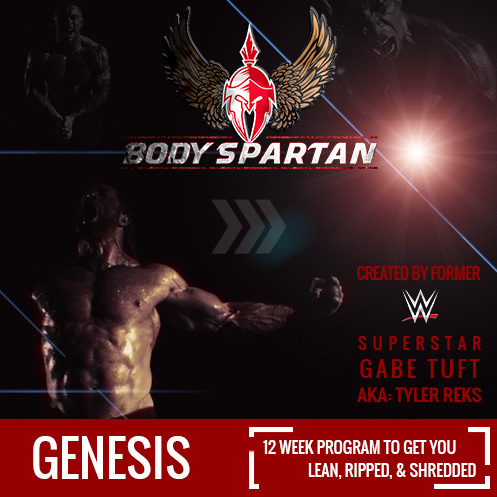 Our Genesis 12-week shredding program has plenty of them. Everything from strength training to mass training, this program will get you lean, ripped and shredded – and no one skips leg workouts on our programs. Trying this tomorrow! My gym has limited equipment what can I substitute for the power squat good morning’s? Thanks for all the advice will be getting genesis program next week! As for the power squats and hack squat, you can focus more on front squats and leg press. Same muscles, just a different movement. Holy good god! At hack squat & good mornings at this moment. Still have Jeffersons to go and I’m thinking I shouldn’t have road the Harley here. Love it!! Love leg days, but how do I walk home after this haha. Great video and workout. I love the motivation body spartan constantly promotes. Can’t wait to see y’all at golds gym in Seattle. Thanks David! Quick note – we are moving the event location in Seattle. Gold’s has a conflict that day. It’s looking like Seattle Athletic Club may be a good possibility. We’ll send out an email this week to confirm! I have been doing this routine for my last 3 leg days and have noticed a big difference, I added 5 sets of 6-8 reps of back squats for a warmup not going to heavey love the feeling after leaving the gym.